This kit allows the creation of a 2-part polyurethane foam. Please refer to the illustrated procedure below. Part A is a viscous cream-colored liquid containing a polyether polyol, a silicone surfactant, and a catalyst. 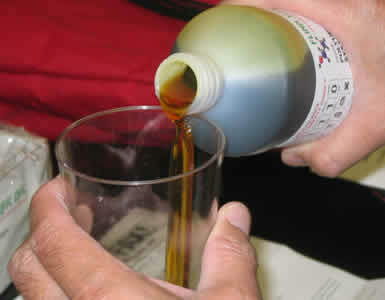 The polyether polyol is a substance such as polypropylene glycol. The hydroxyl end of the polymer is the reactive site. The silicone surfactant reduces the surface tension between the liquids. The catalyst is a tertiary amine which aids in speeding up the reaction without chemically changed itself. Part B is a dark brown viscous liquid containing diphenylmethane diisocyanate and higher oligomers of diisocyanate. When the polyether polyol (Part A) is mixed with the diisocyanate (Part B), an exothermic reaction occurs, producing polyurethane. During the course of the polymerization reaction, a small amount of water reacts with some of the diisocyanate. A decomposition reaction occurs and produces carbon dioxide gas, thus causing the solution to foam and expand in volume. 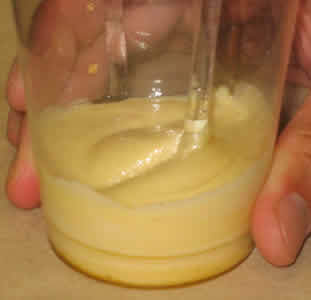 Pores in the mixture are created from the gas; these pores are visible when looking at the rigid substance. The multifunctionality of both reactants leads to a high degree of crosslinking in the polymer, causing it to become rigid within minutes. 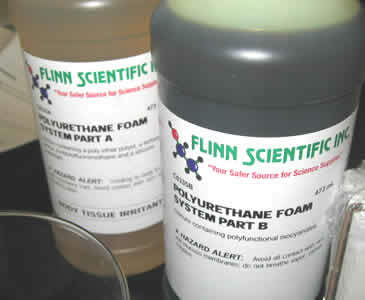 Here is the two-part urethane foam system. 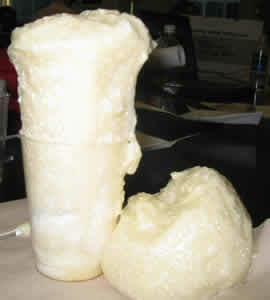 The two bottles make enough foam for dozens of demonstrations. Gently pour a small amount of Part A liquid in a clear plastic cup. 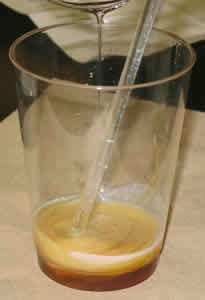 Place an equal amount of Part B liquid in another clear plastic cup. Make sure to put equal amounts in each cup. Spread a paper towel flat on the table, and place one of the cups in the center of the paper towel. Pour the content of the other cup into the cup on the towel..
Stir the content vigorously and observe the change begin. 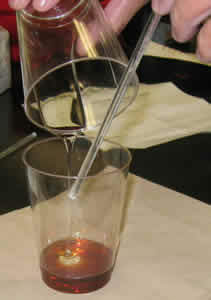 When the mixture begins to expand, stop stirring and remove the glass stirrer. 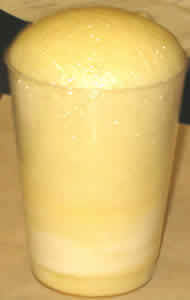 Observe the foam as it expands to about 30 times its original volume. Do not touch the foam until it is completely hardened. Here is the final result. Note that the "head" broke off and toppled over. That's why the paper towel is needed!